The two elder wizards talked late into the night, but thankfully sleep overtook me not long after the meal. I slept luxuriously that night. Mhorik and I set out early the next morning, and truth be told, I was glad to be away from that place. We waved to the last few villagers who had guided us as they walked back. They were barely out of sight when I turned to Mhorik. He saw the scowl on my face and chuckled to himself. We walked on in silence as I thought about this. I never really thought about other wizards much, let alone apprentices. A thousand questions flooded my mind: Why was Mhorik generous to me? Was it because I was a girl? Was it because he thought I’d become too powerful? Or not powerful enough? We journeyed on for a few more days while I was lost in thought. Mhorik seemed to understand I needed distance, and there was no idle chatter. I started going through everything in my head and questioning it. Was Mhorik a good teacher? Did he push me too hard? Not hard enough? Was he a capable wizard? Despite being male? Because he was male and had to work harder? More and more questions came to me with each passing day, but no answers. I was broken out of my thoughts suddenly when we were walking along a hunting path one afternoon. Mhorik suddenly pushed me into the underbrush with him. “Shh!” he hissed into my ear. 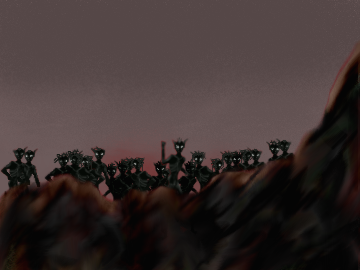 I shifted around and looked just above the foliage to see a small band of Kobolds marching along the path ahead. They were armed with large clubs and crude spears; a marauding party looking for targets. “Fight?” I breathed the question to Mhorik as I ducked my head down. He sucked a bit of air between his teeth, poked his head up quickly, and then back down. “Yes,” he said decisively, his knuckles white from gripping his staff. My mind raced as I considered the magic I should wield. I felt Mhorik wrap some magic around us. “Protection,” he whispered. Mhorik looked at me, thought a moment, then smiled. He nodded approval. I swallowed hard and held my breath. He tapped me on the shoulder, once, twice, three times…. On the third tap, we sprung out of hiding and into the open. The wind spell on my lips as we stood, causing the air between us and the group to churn. One Kobold shouted in alarm, and a few hurled their spears at us, easily knocked aside by the wind. I concentrated on my next spell, tracing the rune on my arm. I didn’t really need the rune to summon the fire, but I did need it for control. I planted gouts of fire all around the enemies, discouraging their advance without trying to kill them all. One of the Kobolds went into a frenzy and charged anyway, consumed by flame before he even took five steps beyond. A few more spears hurtled toward us. My wind spell was weakening, but still potent enough to knock the short spears aside. I concentrated more fire around the group, trying to force them away from us. I inhaled deeply, concentrating hard but feeling the strain of the magic. A quick look at the field let me know that Mhorik had not cast any magic at the group. What was wrong? As if on cue, Mhorik uttered a final word of power. It shook the air around us as a bolt of lightning struck the ground near the Kobolds. The explosive force drew in the fire and then expelled it in a wicked blaze of destruction. Bodies hit the ground, and the others went running off the path, into the tall grass and away from us. I sat down hard, letting my concentration drop. A few flames still burned, sustained by the bodies instead of my own will. The smell was terrible, but I was too tired to care. I pulled out a bit of water and drank deeply. Mhorik reached down and I handed the skin to him. Then I laughed. Had Mhorik been a good teacher to me? The fact I was still alive to ponder the question after that answered it quite decisively for me. Heena closed her eyes, took a calming breath, and strained her senses. She could almost feel the nearby sacred place, but something hindered her. She could feel her tribe around her, quietlysetting down their burdens, knowing that this could take a while. Saska stood nearby, copying Heena’s actions and straining her own senses. Her tribe shouldered their loads again and made ready to move in easy motions. The meet of the tribes wasn’t for a while yet, but when two tribes were so close to each other it was proper to greet each other. Even if the other tribe were the crude Green Hunters, those that use their weapons to kill instead of for hunting food. Heena looked down at Ree’s large belly. “Can you not make it?” she asked with concern. The pregnancy had lasted since the summer season, but she had not complained yet. At her sign, the tribe started running in the direction Heena indicated. More violent screams filled the air as they got closer and closer. 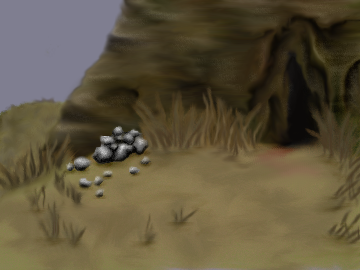 Outside a narrow cave they saw the Green Hunters tribe and a pile of the small green bodies of their victims. Heena frowned and almost spat a curse when she saw one of the sacred cairns had been knocked over. Only one of the five hunters turned to notice. The others stared at the cave holding spears with shiny stone spearheads and heavy clubs at the ready for any of the green ones that dared get too close to the opening. 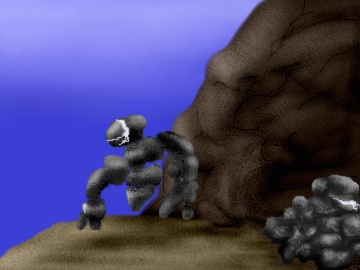 Illis backed two steps away from the cave and the rest shifted position to block any way out of the cave. Illis planted her spear in the ground and started unwrapping the blood-stained, supple leather that served as padded armor. Taking some water, she hastily washed blood off her skin that had soaked through. “Hail, kin. The hunt is good, see?” She showed a savage grin. “You disrupted the sacred site,” Heena said, dropping formality. “I didn’t notice,” Illis said, a smirk replacing the grin from her face. A sudden scream pierced the air as a small green blur rushed from the cave. The hunters moved as one deadly force: a step here, a dodge there, a brilliant spear thrust then the sudden end of the scream. The green one convulsed on the end of spear then fell limp. “Spoiled, spoiled, the sacred place is spoiled,” Saska moaned from the back of the group. “Ha! The young one should learn to hunt, not pile rocks,” Illis said as she looked back at Saska with barely contained scorn. Illis shrugged and looked back at her own tribe. They were putting away their weapons and unwrapping their padded armor as well. Some remembered the courtesy of quickly washing before meeting with their kin. Only Sana stayed back, taking ears from the corpses as trophies for their accomplishments. “I see the useless tribe is here,” Tanham said as he approached the group with a mocking grin on his face. “Yes, leader,” Tanham mumbled through his clenched teeth. He bowed low before Heena and backed away. He turned quickly and moved away, hands checking his face. “Sorry, my kin. I do not approve of speaking insults to other tribes.” Illis frowned and glanced off to the side. “Things change, Heena. But, now we must go. Good travels, kin,” Illis said as she started to gather her gear together. “You, too,” Heena said without much warmth. She motioned to her tribe and they continued their trek toward the sea.